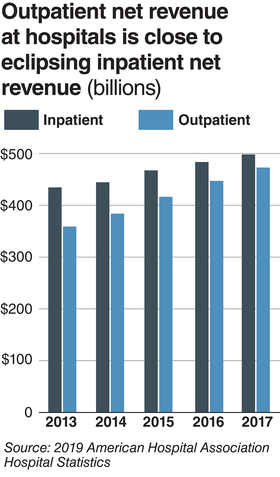 The gap between U.S. hospitals' outpatient and inpatient revenue continued to shrink in 2017 as more patients elect to get care in cheaper outpatient settings, and some believe a flip is inevitable in the coming years. The American Hospital Association's 2019 Hospital Statistics report showed hospitals' net outpatient revenue was $472 billion and inpatient revenue totaled nearly $498 billion in 2017, the latest year for which the report covers, creating a ratio of 95%, up from 83% in 2013. "It certainly reflects continued efforts from hospitals to make sure that people get the right care at the right time in the right setting," said Aaron Wesolowski, the AHA's vice president of policy research and analytics. "We've seen inpatient utilization drops in recent years and outpatient has increased." Hospital profits reached $88 billion in 2017, a 12.5% increase over the previous year and a 27% increase from 2013. Total net revenue reached $1 trillion in 2017, compared with $998 billion in 2016. Expenses in that time were $966 billion, up from $920 billion. The AHA provided Modern Healthcare with an exclusive copy of the report. The jump in profit in 2017 was higher than in recent years. In 2016, profits increased 4%, compared with a 0.25% decline in 2015. During that time, operating revenue increased just 4.6% in 2017, a lower rate than 2016 and 2015. During the same time, non-operating revenue, which includes investment income, jumped 92%, down from the 103% spike in 2016. Wesolowski attributes the slowed operating revenue growth to stabilizing utilization. "That's certainly a heavy driver," he said. The data illustrate the continued slow bleed of patients out of hospitals. Admissions to the 5,262 U.S. community hospitals and their nursing home units increased by less than 1% to 34.3 million in 2017, from 34 million in 2016. Community hospitals include nonfederal, short-term general and special hospitals. Inpatient days were largely unchanged at 186.2 million during that time. Both inpatient surgeries and births declined slightly between 2016 and 2017 to 9.1 million and 3.7 million, respectively. But the gradual decline in inpatient volumes didn't translate into a significant outpatient boost in 2017. Outpatient surgeries were mostly flat at 19 million, as were emergency room visits at 144.8 million. Outpatient visits inched up by a modest 1.2% year-over-year, to 766 million in 2017. Those numbers generally include urgent care and ambulatory surgery center visits, except for cases when the facilities are not directly affiliated with a specific hospital, AHA spokeswoman Marie Johnson wrote in an email. Even as outpatient volumes were relatively flat year-over-year, net outpatient revenue increased 5.7% between 2016 and 2017. Chuck Alsdurf, director of healthcare finance policy and operational initiatives at the Healthcare Financial Management Association, said it's not surprising to see outpatient revenue grow as procedures increasing shift into outpatient settings. He said part of that is driven by the CMS' two-midnight rule created in 2013, which directs Medicare contractors to deem a hospital admission legitimate if it spans two midnights. "Typically when things move from inpatient to outpatient, especially on a procedural basis, the charges go down, as well as the payment," Alsdurf said. He predicts hospitals' outpatient revenue will eclipse inpatient revenue, but that's still several years out. The amount hospitals reported having spent on uncompensated care was $38.4 billion in 2017, the same as in 2016. There were 6,210 total hospitals in the U.S. in 2017, according to the AHA's data. That's nearly 9% more than a decade earlier, in which the U.S. had 5,708 hospitals, and slightly more than in 2016, in which there were 6,168. The total hospitals figure includes not-for-profit, investor-owned, state and local government-owned hospitals and veterans hospitals. The number of rural community hospitals declined nearly 8% between 2017 and 2013, to 1,875, while the number of urban hospitals increased nearly 2% during that time to 3,387. Among community hospitals, 3,494 were part of a system in 2017, up from 3,467 in 2016 and 3,322 in 2013. Fewer hospitals were members of group purchasing organizations in 2017 compared with 2016: 3,583 versus 3,726. The number of full-time and part-time community hospital employees increased slightly to 4.5 million and 1.6 million, respectively, in 2017. Adjusted expenses per inpatient stay were higher at not-for-profit hospitals in 2017 compared with their investor-owned counterparts. Not-for-profits spent $13,504 per inpatient stay, while investor-owned hospitals spent $10,273 for the same stay. That number was even higher for state and local government hospitals: $14,015. That's not surprising given investor-owned hospitals have a completely different operating model, Alsdurf said. They staff differently, and their scale allows them greater purchasing power and efficiency. Plus, there's pressure from Wall Street. "I still think the biggest reason is because they're run to make money for the investors," he said. "So there is a different goal."